Last night, a day after the botched release of an update to its iOS 8 iPhone operating system, Apple released a new and hopefully improved version that upgrades the software without crippling users’ devices. 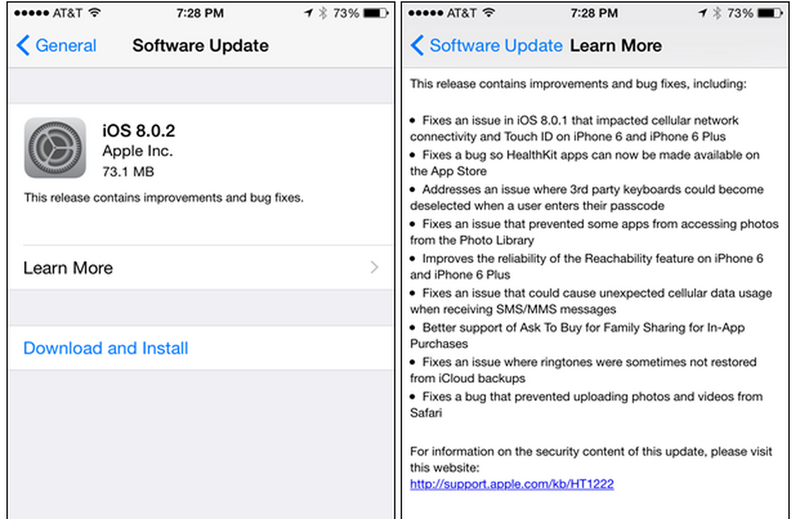 For those who missed it, Apple released iOS 8.0.1 on Wednesday with the intention of fixing some minor bugs in the initial version of iOS 8 along with adding some new functionalities for the device’s HealthKit service. But the company pulled the update after users complained that their iPhone 6 and 6 Plus phones were no longer able to access wireless networks and the Touch ID fingerprint sensor had stopped working. On Thursday night, Apple released iOS 8.0.2 that includes the upgrades from 8.0.1 but allows you to keep using the phone as something other than a really pretty paperweight. Tech writer Dwight Silverman, though initially hesitant to try the latest upgrade, eventually gave in and says that he doesn’t see any ill effects from 8.0.2 on his iPhone 6. However, MacRumors.com reports that some users in Australia were continuing to complain about issues with wireless connectivity and Touch ID even after updating. Those who are truly concerned about a repeat of the recent gaffe, may want to think about waiting a day or so to see if these are flukes or indicators of a larger problem. Meanwhile, Apple says that only about 40,000 people were negatively affected by the 8.0.1 glitch, but offered an apology nonetheless. “We apologize for inconveniencing the iPhone 6 and iPhone 6 Plus users who were impacted by the bug in iOS 8.0.1,” reads a statement from Apple. Previous USPS Wants To Leave Groceries, Other Stuff On Your Doorstep At 4 A.M.